The 600 was the top of Apple's 1992 range of Performa machines designed for the home market. 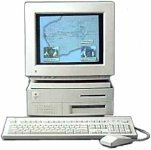 The Performa 600 was the first Macintosh to be shipped with an built-in CD-ROM drive. Preston's Dad brings home the Performa from work, to help his sons set up their new business. 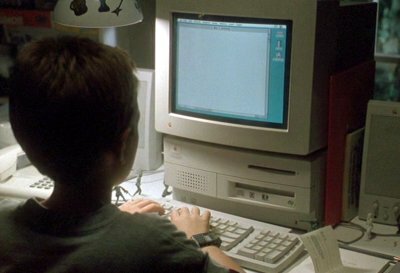 Preston uses the Performa to print the cheque and names his imaginary employer "Mr Macintosh" after it, using voice synthesis on the machine to have phone conversations in his name. Mostly fine, but the computer calculates it would take 342,506 years for Preston's $11 to accumulate to $1000,000 at 3.45% interest when it would actually only take 337 years.